Schumi0101: Club Class ride.. Again..!!! 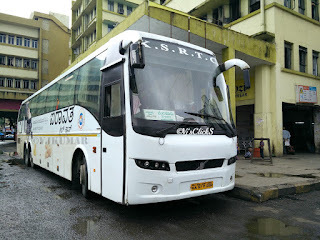 Service: KSRTC Airavat Club Class. It was raining heavily without any respite. Mumbai was getting its fair share of monsoon rains. With my bags packed, it was time to say good bye to the wonderful and full of life filled city of Mumbai. With my ride home still heading towards Mumbai, I decided to bid adieu to comfortable home of my friend and headed to Sion. Off all the times that I have traveled between these two cities, this was the first time I decided to board the bus even before it reached its destination on the onward journey. 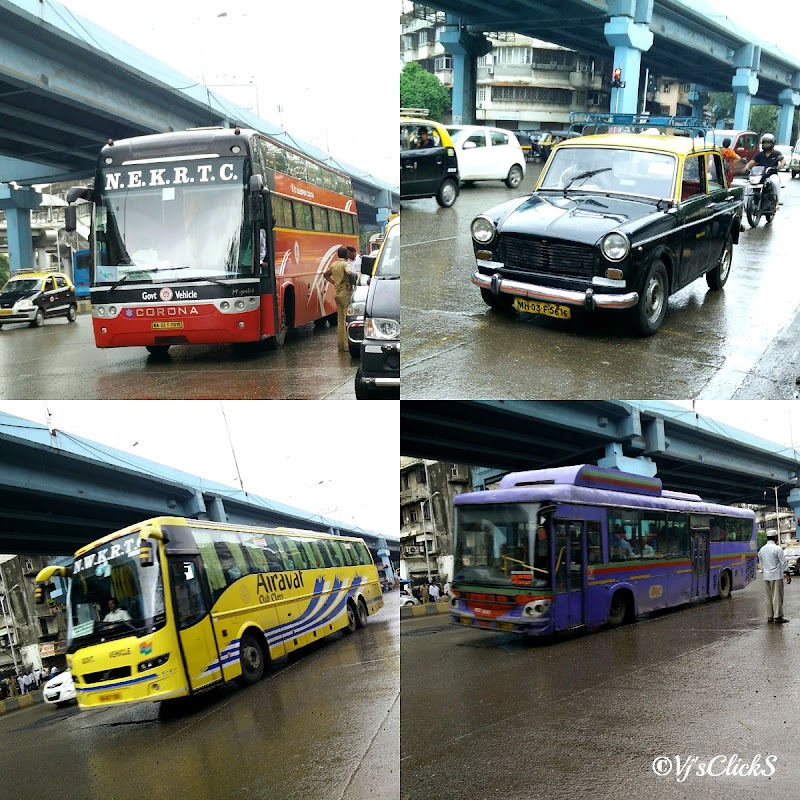 If you are a bus fan, then Sion is the place to be. Though the rains were pounding heavily, people were on the move in the ever bustling city. The white elephant honked his way towards me as I stood there braving the rain. The bus slowed down to pick me up. The crew greeted me and though I still had a long way to go, I knew my memorable journey had started. The bus had around 20 passengers waiting to disembark at their respective points. The city traffic was creating quite a flutter and with rains made it worse. I headed to the rear of the bus and took an empty seat as the bus made its way towards Mumbai Central. While I took a stroll around the bus stand, the crews were busy preparing the bus for the return journey. I came back to find the bus waiting in the platform ready for departure. There were 4 passengers including myself who were boarding the bus from this place. We took a couple of more seats for Bangalore. At the strike of 15:00pm, we honked our way out of the bus stand. The narrow lanes leading out of the bus stand, traffic and the rain made the ride a little uncomfortable but our man was up for challenge. We headed towards Sion and very soon the traffic began to thin out. 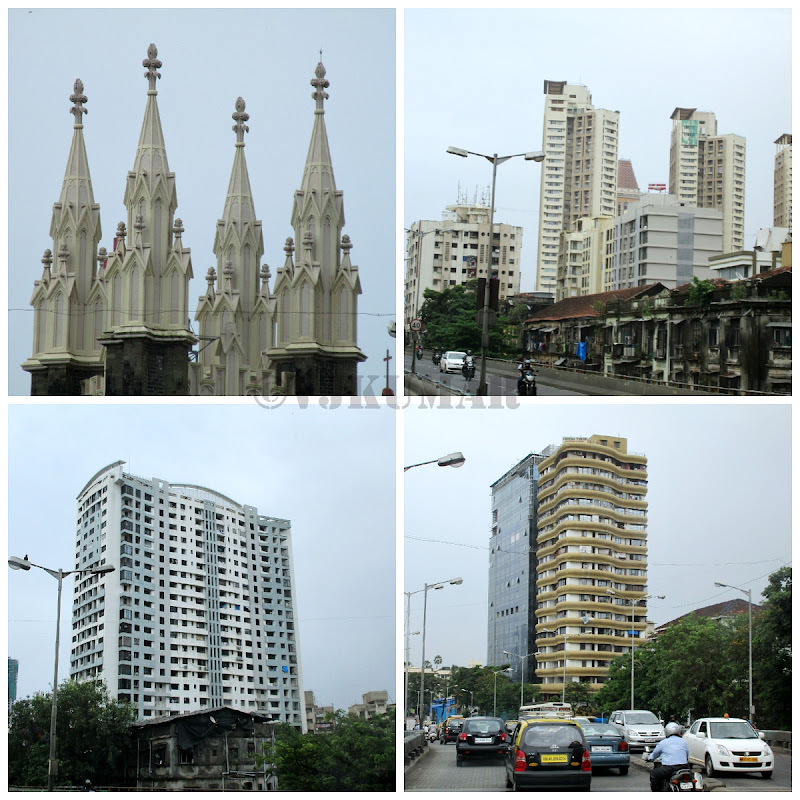 The high rises of Mumbai is absolutely stunning to watch as we coasted towards our destination. A quick glance at the reservation chart revealed that there were around 15passengers boarding from Mumbai. A separate chart was to be given in Kotrud for passengers boarding the bus from Swargate, Pune. We pulled over at Sion for our first set of pickup. No sooner we picked up our passengers we headed towards Chembur. We reached there in no time, thanks to less traffic. We took few more passengers and the last sets of passengers were waiting at Panvel. Enroute to Panvel, we crossed Sion-Panvel E-way and Vashi toll which was having a fair amount of traffic. At 16:28pm the last set of passengers had boarded the bus as we floored the bus towards Pune. Well, words alone cannot describe this section of the highway. This is India's first six-lane concrete, high-speed expressway and this has certainly introduced new levels of speed and safety in automobile transportation to Indian roads. Sadly few (in)sane drivers try to push too hard and the results are devastating. Witnessing few such incidents enroute was certainly scary. 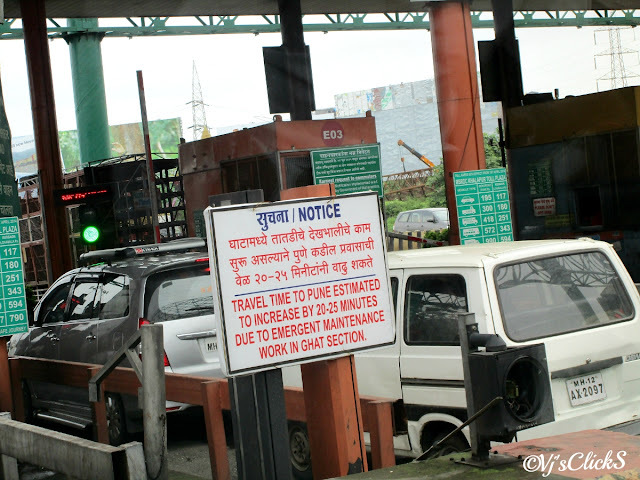 We neared our first toll, Khalapur toll station. A notice was put out about maintenance being done at the Ghats. We crossed the toll and headed towards Lonavala. 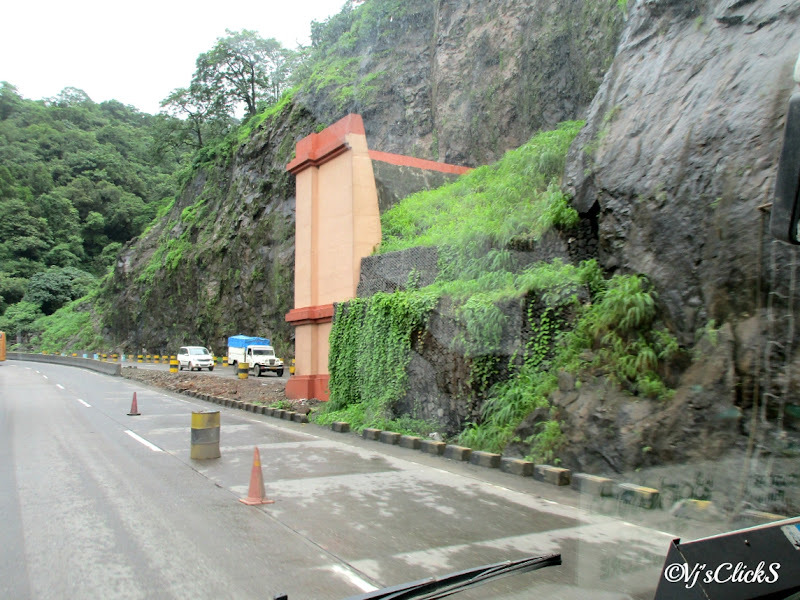 Enroute to Lonavala, we crossed the Adoshi tunnel. A landslide near the same Adoshi tunnel few weeks ago had claimed the life of 2 people travelling in a car. The section was however cleared and traffic was flowing effortlessly. The scenic Lonavala ghat never failed to impress travelers along the route and to witness this sitting at the front was breathtaking. We finally pulled over for our first break near Lonavala. We headed towards the city which was once the base of the prime ministers of the Maratha Empire. We exited the E-way and headed towards Kotrud. As always Pune welcomed us with a traffic jam as we slowly coasted towards Swargate. We reached swargate by 19:30hrs, 30minutes before the scheduled time. Many passengers made a bee line while our conductor came with the new reservation sheet. The 19:00pm Bangalore bound Nasik-Bangalore was nowhere in sight. Our conductor has some hard time as there was some confusion with passengers. 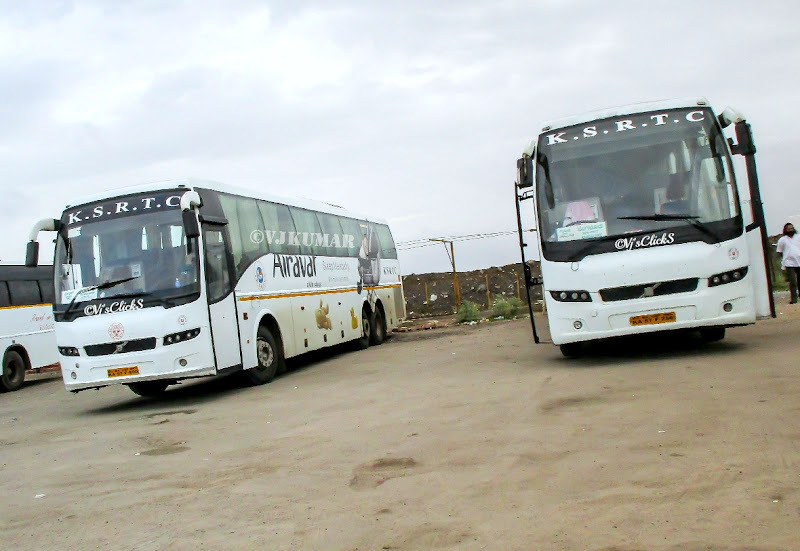 Finally running late by 45minutes, the club class from Nasik pulled into the bus stand. He took his set of passengers and was off in a flash while we waited for a lone passenger. Finally, the lone passenger showed up with a ‘Sorry’ and boarded the bus. We immediately moved out however the damage was done. We wasted approx 40mins as we headed our way back to the highway. We tailgated the Nasik Club Class till Katraj and at the junction took a right turn towards the new Katraj tunnel while he headed straight towards the old Ghat roads. Finally, hunger started to creep in as I looked forward for my dinner break. We pulled over in Natraj and were greeted by an empty parking lot. After enjoying a scrumptious meal, it was time to return back. We started the journey back after a crew change. All the traveling from past couple of days had taken a toll and finally it was time to rest. I sank in my seat and before I knew it, sleep consumed me. The front row ride, No honking, no swerving around ride ensure a good night sleep. I woke up once at Hubli near the toll and fell back asleep in seconds. The ride comfort ensured passengers had a comfortable sleep as the bus coasted towards its destination. A senseless truck changing lane without indicators and a subsequent honking woke me up. The cloudy weather of Hiriyur welcomed us. I tried to sink back into sleep again however; we were heading straight to our last stop of the journey, the breakfast stop. A lone standing pancharangi from Hubli welcomed us in. 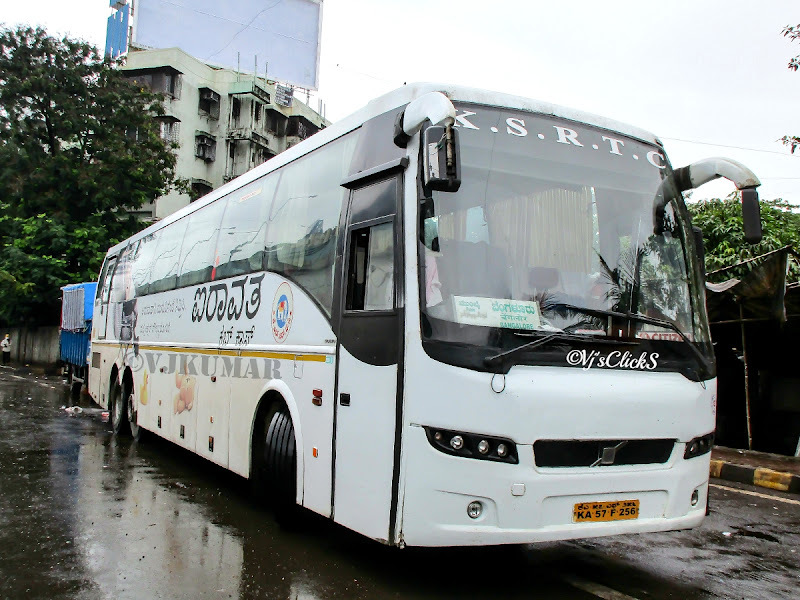 Within minutes, we were joined by Naskik-Bangalore B9R. 15minutes into the break and it was time for the Davangere Club Class to join us in. We were the first one to move out and joined the highway quickly. We coasted along the relatively empty highway as we crossed Sira in no time. We neared Tumkur bypass and pulled over to drop off a passenger. I knew I was home when I spotted a packed BMTC bus heading towards Nelamangala toll. My journey was now coming to an end. I sat back in my seat as the bus coasted on the Nelamangala-Yeswanthpur toll way. We dropped off few passengers in Gorguntepalya and headed towards Yeswanthpur Railway station. Since, the bus does not go via Navrang, I got down at Yeswanthpur bidding adieu to the crew and thanking them for all the memorable moments along the journey. Since this bus departs from Mumbai Central, I am really not sure if I will be able to travel in this bus again. But I am certainly looking forward for another journey with them.